Donald Trump’s appointment of John Bolton as the president’s national security adviser is a strong indication of the stance Trump will adopt towards the Iran deal. The president has until May 12th to amend the Iran nuclear deal with his Chinese, European and Russian partners. John Bolton’s tough, no-nonsense approach will be a valuable addition to the negotiations. John Bolton is a highly principled adviser with experience in the Reagan and George W. Bush administrations. He was undersecretary for Arms Control from 2001 to 2005 and also completed a brief spell as ambassador to the United Nations, where he promoted non-proliferation resolutions towards North Korea and Iran. He has previously been a prominent supporter of regime change in Iran and expressed solidarity with the Iranian opposition, the People’s Mujahedin of Iran (MEK). He spoke at a MEK-organised event in Paris last year where he discussed the importance of regime change in Tehran. He is a shrewd adviser with a deep knowledge of the balance of power and influence around the globe. His experience in both the UN and previous presidential administrations has also equipped him with a comprehensive understanding of governmental bureaucracy. In what is arguably the most influential position in the US foreign policy mechanism, he should be able to bring US foreign policy to apply further pressure to the oppressive Iranian regime. 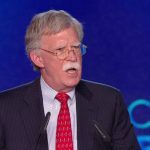 Rather than persist with the decades-old policy of appeasement towards the Iranian government, Bolton’s appointment could indicate the beginning of a firmer policy towards Iran. The Iranian regime has been uncooperative to demands from the international community. Bolton would prefer to take a more aggressive stance with Hassan Rouhani. While he does not advocate military intervention, he would prefer to see tougher sanctions that would leave Rouhani’s regime with no other option but to comply and abandon their hard-line, disruptive policies, or face economic ruin. Recent MEK-organised demonstrations show the appetite of the Iranian people for change. Tens of thousands of protestors flooded the streets across the country demanding regime change. This was just the beginning. Maryam Rajavi, MEK leader and president-elect of the National Council of Resistance of Iran (NCRI), has called for the new year to be a “year full of uprisings”. It is in the interests of the United States to adopt a stance towards the Iranian regime that reflects the will of the Iranian public. The mullahs in Iran have tried to suppress the democratic message of the MEK. However, it is now resonating across Iran’s rural and urban populations. The MEK also enjoys bipartisan support across the US Congress and Senate. Rudy Giuliani, Newt Gingrich, Howard Dean and Bill Richardson have all expressed solidarity with the MEK and supported regime change in Iran. Senior advisers in the Obama administration, like James Jones, also advocated a tougher stance against Hassan Rouhani’s government. With both the Iranian public and both sides of the House demanding a tougher attitude towards the Iranian regime, the time is right for Trump to adjust the position of the White House. 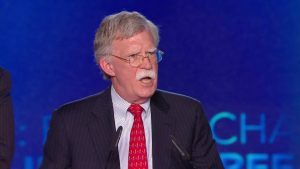 John Bolton might be the man to steer the US ship towards regime change in Iran. The title of his memoir, Surrender Is Not an Option, says it all. In Iran, surrender is not an option. The stakes are too high. The people have spoken. They want regime change. Now it is time for the international communities to help bring the will of the people to fruition. The days of US appeasement to Iran may be numbered. It is time to usher in a new chapter in US-Iran relations.